We’d love your help. Let us know what’s wrong with this preview of Never Cry Wolf by Farley Mowat. To ask other readers questions about Never Cry Wolf, please sign up. Originally thought to be a true story but , was proven false, Yes? Mowat was proud that he never let facts get in the way of storytelling. This is a book I both love and hate. I love it because I love wolves and this is a well-written, entertaining story about wolves. I hate it's made up from start to finish, yet the tagline on the cover says, "The incredible true story of life among Arctic wolves." Let's get one thing straight: Never Cry Wolf is fiction. Made up. Fabricated. And quite a lot of it is, at least in terms of factual accuracy, horseshit. Mowat knew a lot about life in the Arctic, but he didn't know much about wolves. Wha This is a book I both love and hate. I love it because I love wolves and this is a well-written, entertaining story about wolves. I hate it's made up from start to finish, yet the tagline on the cover says, "The incredible true story of life among Arctic wolves." What he knew, he admired. This was in the early 1960's, when a lot of people were bent on systematically eradicating the wolf as a species. If I remember correctly from reading a long-ago interview with him, Mowat fully intended his book to be pro-wolf propaganda. As such, it probably succeeded: it sank deep into the public consciousness of wolves, and surely helped the great turnaround of the wolf's image in the western world. Its fundamental thesis was "wolves are okay," and that badly needed saying at the time. Trouble is, now that big truth is largely accepted, we're still stuck with all the little lies. The pendulum has swung the other way. A wolf-handler friend of mine puts it nicely: "wolves are the new dolphins" -- all too often seen as the incarnation of Nature's goodness, wisdom and beauty. Mowat helped convince two generations that wolves are sweet-natured beasts with strong family values and a natural place in the ecosystem. Unfortunately he forgot to mention that they're also damn' great bloodthirsty beasts with strong territorial and dominance drives, a propensity to roam long distances, and a large appetite for ungulate flesh. As a wolf biologist said, despairing of educating the public, "We'll never get past Never Cry Wolf!" Never Cry Wolf has served its day. It's a fine good story, with a strong emotional plotline as the narrator gets ever more involved with the wolves, and a nice line in laconic Canadian humour, but I'll never be able to stomach it while it's marketed as "An Incredible True Story." A recent read of Chandler Brett's excellent novel A Sheltering Wilderness, the first volume of his projected Wolf Code trilogy, brought to mind this nonfiction book which I read decades ago, and which is a groundbreaking classic in the field study of wolves in the wild. My wife and I read it together, and both found it not only fascinating but enormously educational. It's one of many pre-Goodreads nonfiction books I haven't made time to review until now; and in the meantime, like most of those, A recent read of Chandler Brett's excellent novel A Sheltering Wilderness, the first volume of his projected Wolf Code trilogy, brought to mind this nonfiction book which I read decades ago, and which is a groundbreaking classic in the field study of wolves in the wild. My wife and I read it together, and both found it not only fascinating but enormously educational. It's one of many pre-Goodreads nonfiction books I haven't made time to review until now; and in the meantime, like most of those, I'd slapped a three-star rating on it to indicate that I liked it. But the reflection of a review quickly convinced me that five stars are justified; it would be true to say that Barb and I both really liked it, but also true that the information Mowat imparts is at times genuinely amazing. The late Mowat (he died in 2014) was, during almost all the decades I've been alive, Canada's premiere naturalist, and the author of numerous books written to share his research with the general public. This one is one of his earliest books, and most popular (it was actually adapted in 1983 as a feature film, though from what little I've seen of the latter, it doesn't follow the book very closely), and describes his very first field research assignment, just out of college and newly employed by the Canadian government's Dominion Wildlife Service. At that time, the politically influential sport hunting lobby, whose members were concerned about diminishing kills from their caribou hunting, was convinced that predation by wolves was the cause of the decline in the caribou population, and was pressuring the government to pursue an aggressive policy of wolf eradication. Mowat was sent to the Keewatin Barren Lands of Canada's Northwest Territory (an area where gray wolves and caribou shared habitat), ostensibly to "study" wolf-caribou interaction, but really with the pretty much baldly stated goal of bringing back a report that would "prove" the hunting lobby's contention and justify the policy they were advocating. The body of the book is a detailed account of his life that summer in the sub-arctic Canadian wild, and his close observations of the behavior and interactions of a pack of wolves whose den was quite close to his camp. If you believe the stereotypical image of wolves, handed down from ancient and medieval writers in a culture that automatically feared wolves but never bothered to study them, and reinforced by equally ignorant modern propagandists, you'll be in for some considerable surprises. Yes, they are carnivores, with everything that implies. (So, for that matter, are our pet dogs and cats --and not many humans are vegetarians, either.) But they're not the slavering, vicious monsters out to kill anything that moves depicted in popular portrayals. They never showed any aggression toward the author (even when, on one occasion, he crawled into the den with, unbeknown to him at the time, two wolves in it! ), and they respected his space once he marked his territory with urine, the same way that they did. It turns out that in fact there has never been a documented case in all history of a human being attacked by a healthy wolf (rabid animals of any species, of course, are a different phenomenon). They're intelligent and playful animals, who mate for life and display highly cooperative social interactions in their packs. Oh, and that wholesale slaughter of caribou herds under the bloody fangs of ravening wolves? Doesn't happen. A wolf pack can occasionally bring down a single caribou; but the individuals they're able to fell are typically the aged, sick or infirm, whose fate is sad for that individual but leaves more grazing for the healthy members of the herd. (The First Nations saying about the subject is that "Wolves make the caribou strong," rather than the reverse.) The animal that furnishes the staple bulk of their diet is actually the field mouse, so they're rather helpful to humans in terms of vermin control. (Mowat field tested that diet on himself, to prove that it could sustain a large mammal in good condition, and developed several recipes in that successful experiment; he shares the one for souris a la creme --creamed mice-- here, but Barb and I didn't try it. :-) ) It also turns out that the decline in the caribou population was mainly driven by illegal hunting at the hands of humans. One of the most intriguing discoveries Mowat details here grew out of his interactions with the local Inuit people, especially Ootek, who became a friend. Ootek was the son of a shaman and a minor shaman himself, and something of an expert on wolves --as a five-year-old child, he'd been deliberately left for 24 hours with a pack of wolves; the pups had played with him and the adults sniffed him but didn't harm him--and the author eventually discovered that his friend believed the wolves could verbally communicate factual information to each other by their howls, barks, etc. Not only that, but Ootek could actually understand a good deal of this language himself. (This belief was also not unique to Ootek; it was quite common among the area's natives.) Mowat's reaction to this was as skeptical as yours probably is, and as mine was --until there were incidents, recorded in the book, that convinced both the author and I that what Ootek claimed is the sober truth. To my knowledge, this discovery has never been seriously followed up by other researchers, and I absolutely think it should be; it's the kind of thing that cries out for more to be known! One of those books that if fun to review because my feelings about it change depending on how I look at it. As a pure book of science reporting/writing, it is probably a noble failure. As a influential environmental book, it is probably a wild success. I picked this up due to fond memories of viewing the 1983 movie in biology class. In this 1963 book, naturalist Farley Mowat chronicles his experiences observing wolves in the Canadian barrenlands 1948-49. I have mixed feelings about the book. On the plus side: it presented a positive image of wolves and stirred interest in their preservation. However, as a scientist I'm put off by the embellishments Mowat throws in both to make the story more entertaining and to sway the reader toward his point I picked this up due to fond memories of viewing the 1983 movie in biology class. In this 1963 book, naturalist Farley Mowat chronicles his experiences observing wolves in the Canadian barrenlands 1948-49. I have mixed feelings about the book. On the plus side: it presented a positive image of wolves and stirred interest in their preservation. However, as a scientist I'm put off by the embellishments Mowat throws in both to make the story more entertaining and to sway the reader toward his point of view (even though I hold similar beliefs). There are some non-fiction books where stretching the truth doesn't bother me. An example of this is Bill Bryson's travel writing. Bryson will embellish in order to capture the essence of a person or place, or to add humor. But I'm not expecting a historical account of what happened on his trip -- one of the reasons I read Bryson is to get his impressions, rather than an absolutely factual account. Crazy, but absolutely amazing. Mowat moves in next to a pack of wolves & observes them. His description of 'marking' his territory (with the help of several pots of tea) & how the alpha male managed the same feat with a single pass, showing far better control, is both funny & exhilarating. He's cut off a part of their path as his territory, sits there weaponless & participates with them at their level. That pretty much describes the book. It's fascinating. I'd forgotten how good this book was. It's funny, educational, & heartbreaking. It's a must-read for anyone who likes the environment, north woods, wolves, &/or science as Mowat finds out that everything he'd been taught was wrong. In the 1950s, Mowat finds himself tasked to learn about the wolves of the north woods which are supposedly wiping out the caribou population. The wolves are ferocious & are killing wantonly - everyone says so. In a series of hilarious events, he finds himse I'd forgotten how good this book was. It's funny, educational, & heartbreaking. It's a must-read for anyone who likes the environment, north woods, wolves, &/or science as Mowat finds out that everything he'd been taught was wrong. In the 1950s, Mowat finds himself tasked to learn about the wolves of the north woods which are supposedly wiping out the caribou population. The wolves are ferocious & are killing wantonly - everyone says so. In a series of hilarious events, he finds himself alone in the wilderness & takes up wolf watching. What he finds is fantastic & completely at odds with common lore. While he anthropomorphizes the wolves a little too much, he certainly does them justice & shows the real culprits. This book was originally written in 1963 and my 30th anniversary edition had a new preface by the author in which he said his practice was "...never to allow facts to interfere with the truth...humor has a vital place in helping us understand our lives." So do we allow this statement to color our judgment of this book? Is it a true story or an embellished one or a totally made up one? Did Mowat really go into the wild and live with wolves the way he said he did? Did he see the behaviors he descri This book was originally written in 1963 and my 30th anniversary edition had a new preface by the author in which he said his practice was "...never to allow facts to interfere with the truth...humor has a vital place in helping us understand our lives." So do we allow this statement to color our judgment of this book? Is it a true story or an embellished one or a totally made up one? Did Mowat really go into the wild and live with wolves the way he said he did? Did he see the behaviors he described or did he imagine them from the warmth of a paneled office somewhere? Does it really matter? Some people will say yes, others will say no. I am somewhere in the middle. When I first read that preface I wondered...could I believe this man? But I have read and thoroughly enjoyed so many other titles by this author that it doesn't matter. I loved the story of his time observing wolves in the wild. Mowat made me laugh (mostly at his own foolishness); he made me wish I could see wolves in person myself; he made me dream a bit. And that was exactly what I had hoped for when i began the book. Written in the sixties, this book follows the year that naturalist Farley Mowat lived among the wolves. 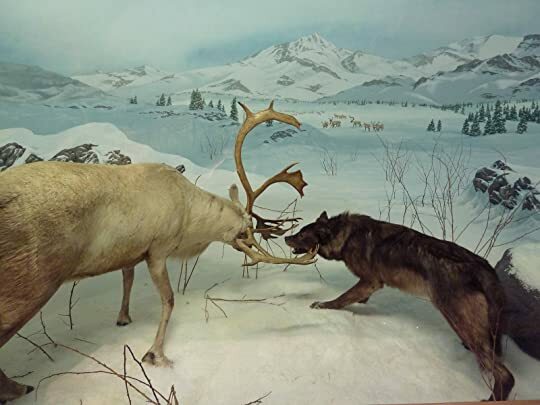 Hired to observe these wolves up in Canada to see why they were killing caribou, Mowat uses humor, observation, and a bit of personification to narrate his observations of wolf behavior and what he learned from his time living in the wild. I had to read this for my English class this semester. It followed about four other books on natural systems that I did not care for at all, and I'm happy Written in the sixties, this book follows the year that naturalist Farley Mowat lived among the wolves. Hired to observe these wolves up in Canada to see why they were killing caribou, Mowat uses humor, observation, and a bit of personification to narrate his observations of wolf behavior and what he learned from his time living in the wild. I had to read this for my English class this semester. It followed about four other books on natural systems that I did not care for at all, and I'm happy to say I actually really enjoyed this. It's approachable, hilarious, and easy to read. Mowat seems like the kind of guy that'd be fun to go drinking or camping with (though, if that's a good thing in a scientist is probably debatable). Instead of mindlessly journaling boring observations, he helps the reader feel a bond with "Wolf A" and "Wolf B" by giving them human names, and little stories. I genuinely cared about these wolves that lived over half a century ago. Να και το πρώτο πεντάστερο βιβλίο για φέτος. Πρόκειται για ένα καταπληκτικό μικρό βιβλίο, που από την μια σε ταξιδεύει, σε κάνει να νιώθεις όμορφα με τις περιπέτειες του συγγραφέα στην Αρκτική για την παρακολούθηση των λύκων και σου φτιάχνει το κέφι με το πολύ ωραίο και ευχάριστο χιούμορ του, από την άλλη όμως σε βάζει να σκέφτεσαι κάποια πράγματα για την καθημερινότητά και τον κόσμο γύρω σου, καθώς και για την αντιμετώπιση των ανθρώπων απέναντι στους λύκους και κατ'επέκταση απέναντι σε όλα τα ζ Να και το πρώτο πεντάστερο βιβλίο για φέτος. Πρόκειται για ένα καταπληκτικό μικρό βιβλίο, που από την μια σε ταξιδεύει, σε κάνει να νιώθεις όμορφα με τις περιπέτειες του συγγραφέα στην Αρκτική για την παρακολούθηση των λύκων και σου φτιάχνει το κέφι με το πολύ ωραίο και ευχάριστο χιούμορ του, από την άλλη όμως σε βάζει να σκέφτεσαι κάποια πράγματα για την καθημερινότητά και τον κόσμο γύρω σου, καθώς και για την αντιμετώπιση των ανθρώπων απέναντι στους λύκους και κατ'επέκταση απέναντι σε όλα τα ζώα και ολόκληρη την φύση. Ο Φάρλεϊ Μόατ, που την έζησε την ζωή του (1921-2014), ήταν ένας πασίγνωστος φυσιοδίφης, ένθερμος υποστηρικτής της προστασίας του περιβάλλοντος, περιπετειώδης χαρακτήρας και τολμηρός εξερευνητής. Στο βιβλίο αυτό παρακολουθούμε τους μήνες που έζησε στην Αρκτική, είτε μόνος του είτε παρέα με κάποιους απομονωμένους μα φιλικούς Εσκιμώους, με σκοπό την παρακολούθηση των συνηθειών των λύκων της περιοχής. Ο Μόατ έγινε ένα με τους λύκους και κατάλαβε ότι πολλά πράγματα που υποτίθεται ότι γνωρίζαμε ή πιστεύαμε γι'αυτούς, ήταν πολύ μακριά από την πραγματικότητα. Το θέμα είναι ότι εκείνα τα χρόνια (το βιβλίο εκδόθηκε το 1963 αλλά αυτά που περιγράφει ο συγγραφέας πρέπει να διαδραματίστηκαν μέσα στην δεκαετία του '50), οι διάφορες κρατικές και τοπικές υπηρεσίες, είχαν μια ιδιαίτερα επιθετική πολιτική απέναντι στους λύκους. Χώρια τους γουναράδες και τους κυνηγούς... Όσον αφορά την γραφή, είναι τρομερά ευκολοδιάβαστη και ιδιαίτερα ευχάριστη, με πολύ ωραίες περιγραφές των τοπίων, των διαφόρων δραστηριοτήτων του συγγραφέα και αρκετών αξιομνημόνευτων περιστατικών. Το χιούμορ, όπως είπα στην αρχή, είναι μπόλικο και σίγουρα ευπρόσδεκτο. Ο Μόατ δεν ντρέπεται να αναφέρει περιστατικά τα οποία και μόνο στην σκέψη θα τον έκαναν να κοκκινίσει από ντροπή (γέλασα πολύ σε αρκετές περιπτώσεις). Τέλος πάντων, είναι ένα εξαιρετικό βιβλίο, από την πρώτη μέχρι και την τελευταία σελίδα. Διαβάζοντας αυτό το βιβλίο θα μάθετε αρκετά πράγματα για τους λύκους αλλά και γενικά για την φύση, χωρίς όμως να σας κουράσει με επιστημονικούρες και ατελείωτα κατεβατά γεμάτα ορολογίες (πολύ απλά, δεν υπάρχουν!). Επίσης είναι ένα βιβλίο που θα σας ταξιδέψει, θα σας κάνει να χαλαρώσετε χάρη στο χιούμορ και τις "περιπέτειες" του συγγραφέα του, ενώ θα σας κάνει να σκεφτείτε και κάποια πράγματα για την φύση και τον κόσμο γύρω σας. Το μόνο σίγουρο είναι ότι θα το ξαναδιαβάσω αρκετές φορές στο μέλλον. Προς το παρόν, όμως, θα μου λείψει. Farley Mowat's Never Cry Wolf is a classic of environmental, wildlife and adventure literature -- beautifully written, funny and moving all the way to its gorgeous final pages, which, I admit, made me cry. A marvelous film of the same title was made from this book in 1983, which I would also highly recommend, if you've never seen it. Of course, it's no substitute for this book, but is excellent in its own right. The book starts out as a sort of MASH-like satire on the nonsensical bureaucracies of Farley Mowat's Never Cry Wolf is a classic of environmental, wildlife and adventure literature -- beautifully written, funny and moving all the way to its gorgeous final pages, which, I admit, made me cry. The book starts out as a sort of MASH-like satire on the nonsensical bureaucracies of the Canadian government, as field scientist Mowat finds himself on the floor of the desolate frozen tundra after a harrowing ride in a spit-and-gum plane helmed by an eccentric pilot. Set down there with an impossibly massive bulk of expensive government scientific and survival gear and some foul clandestine hooch, Mowat's mission is one that is decidedly anti-wolf. In the course of gathering data about wolf behavior that is ostensibly designed to prove them to be senseless, bloodthirsty, excessively destructive killing machines -- and thus justifiable fodder for destruction themselves -- Mowat instead finds them to be social, highly evolved beings whose imprint on the environment is light and beneficial. Debate over the authenticity of this book has raged for decades, and it's hard to know how much of it is true or made up out of whole-cloth. But Mowat did something that needed doing, and that's to bring the debate on wolves closer to a sane center instead of the histrionic mythological extreme that has consigned wolves and other animals to the reckless bent of murderous humans for so long. Mowat's voice is a bemused one, a tad smug perhaps. He is the arrogant, snarky know-it-all guy who is so funny and erudite that you can forgive his arrogant, snarky know-it-allness. You gotta love it when someone refers to his own farting as "my demon drummer of the nether depths." The book is a gem, awe-inspiring and evocative, and a thoroughly delightful read. I don't care if there is controversy around this book having some, or a lot, of fabrication to it. The message is clear: It's not wolves who are the problem, it's humans. I enjoyed the writing style - at times it was quite funny, other times what he described was gut-wrenching. I felt as if I was there with him in the Arctic, getting to know the wolves and the indigenous people who lived there. I recently visited a wolf sanctuary in New York for my birthday. It was an amazing experience; they hav I don't care if there is controversy around this book having some, or a lot, of fabrication to it. The message is clear: It's not wolves who are the problem, it's humans. I recently visited a wolf sanctuary in New York for my birthday. It was an amazing experience; they have four ambassador wolves that visitors are allowed to "meet" (you can't get close). I learned a lot about wolves, their behavior, and sadly, how humans destroyed wolf populations. This book echoed a bit of what I learned at the sanctuary, and not going to lie, it depresses me. Would recommend this text to anyone who respects wildlife, particularly wolves. Mowat, a naturalist/biologist is given an assignment: spend the summer in the subarctic and study wolf behavior, particularly, their feeding habits. Mowat discovers one wolf family and follows them closely, for several months. It is an eye-opening experience, giving him a deeper understanding and compassion for this misunderstood animal. This is a terrific read. Funny and adventurous. I have heard much of it is fictionalized, but as a story, it really resounds. Surprisingly, it was written, about 50 years ago but still remains fresh and entertaining. In this fictionalized account of Farley Mowat's summer time sojourn to the Arctic in the late 1940s, the harmful myths about wolves are broken and light is shed on their playful, family-oriented nature. At that time, the wolf reputation as an insatiable killer was maintained by trappers who collected a bounty for every wolf hide they produced. There was no scientific research on wolves until Mowat set out specifically to study them. His accounts of the Wolf House Bay pack are eye-opening to him, In this fictionalized account of Farley Mowat's summer time sojourn to the Arctic in the late 1940s, the harmful myths about wolves are broken and light is shed on their playful, family-oriented nature. At that time, the wolf reputation as an insatiable killer was maintained by trappers who collected a bounty for every wolf hide they produced. There was no scientific research on wolves until Mowat set out specifically to study them. His accounts of the Wolf House Bay pack are eye-opening to him, as he expected to be killed as soon as he was dropped off in the Barrens, and there is good information about wolf cub-rearing, inter- and intra-pack communication and nightly hunting routines. But the manner in which Mowat tells his stories is over-embellished to the point of unbelievable and silly, rather than informative (and fiction rather than non-fiction). For example, on the night in spring when the ice began to run the river, causing it to over-flow its banks, Mowat supposedly got in his canoe in the middle of the night to pursue a supposedly stranded Husky pup. Really? I am supposed to believe this? Has he ever seen what a river is like under ice breakup? Bwah. I also found that his interactions with the Inuit people were disrespectful and condescending, despite the graciousness of their hospitality and generosity towards him. The front flap of my hardcover book claims, "Thousands upon thousands of readers believe it to be one of the funniest and most delightful books ever written about anything." Perhaps it was comments like this that got my hopes up too high. Sadly, I am not one of the many thousands. I had come across this book by chance at the bookstore I work at, and with wolves being my favorite animal (particularly arctic wolves as in the book) I just had to at least read the synopsis on the back of the book. I normally never read nonfiction books, simply because I'm not interested in that type of reading. However, when I saw how similar Farley Mowat's views on wolves are to mine, it immediately caught my attention. So many people in the world view wolves as vicious killers and nothing m I had come across this book by chance at the bookstore I work at, and with wolves being my favorite animal (particularly arctic wolves as in the book) I just had to at least read the synopsis on the back of the book. I normally never read nonfiction books, simply because I'm not interested in that type of reading. However, when I saw how similar Farley Mowat's views on wolves are to mine, it immediately caught my attention. So many people in the world view wolves as vicious killers and nothing more, beasts with no remorse for killing humans. They think wolves kill simply to kill. I've always opposed these views, and it's always seriously disturbed me to learn of the ways humans hunt down wolves to the point of extinction of certain species and endangering others. "Never Cry Wolf" is the type of book that I'd highly recommend those type of people to read. It tells of Mowat's personal experiences when he traveled to the far north to observe and study the wolves that dwell there. He wrote of how wrongfully judged wolves are and what they're actually like. Some of my favorite parts were when he described the moments when the wolves knowingly entered within 15-20 feet of him, yet they did not deem him a threat nor did they fully acknowledge him. As for Farley Mowat's writing, I view him as a highly intelligent writer with a great sense of humor. He is extremely knowledgeable in his field when providing the reader with information, yet, when called for, he provides the perfect amount of sarcasm to create laughter and really hold the reader's attention. I was given this book as a gift from one of my coworkers, and because of his powerhouse personality, was actually a little apprehensive to read it. In fact, it sat idly on my bookshelf for nearly 4 months before I dusted it off and gave it a try. While the book did get off to a slow start, a quite non impressive introduction to the world in which the author would inhabit for nearly 2 years, the story was all of a sudden kick-started for me with the introduction of the wolf family. George, Angeli I was given this book as a gift from one of my coworkers, and because of his powerhouse personality, was actually a little apprehensive to read it. In fact, it sat idly on my bookshelf for nearly 4 months before I dusted it off and gave it a try. While the book did get off to a slow start, a quite non impressive introduction to the world in which the author would inhabit for nearly 2 years, the story was all of a sudden kick-started for me with the introduction of the wolf family. George, Angeline, Uncle Albert, and the pups allowed Mowat to create such a beautiful and cheeky narration, on both the emotional and scientific levels. In fact, the little wolf den at Wolf House Bay seemed to be teeming with more humanity and humor than all of the novel's human characters combined. This was a great book for those needing a little reminder of our place IN this world, not just ON this world. I have read this book before, I loved it then and I love it now. I didn't grow up around hunting or around wolves so this book had a profound impact on the way I viewed both. I've always had a love of animals and nature so I was a natural to find this book inspiring, wonderful and incredibly sad. For a book I haven't read in about 30 years I had remarkable recall of most of the scenes. That is probably because of the sense of humor and the pathos with which Farley Mowat writes, it is a beautiful I have read this book before, I loved it then and I love it now. I didn't grow up around hunting or around wolves so this book had a profound impact on the way I viewed both. I've always had a love of animals and nature so I was a natural to find this book inspiring, wonderful and incredibly sad. For a book I haven't read in about 30 years I had remarkable recall of most of the scenes. That is probably because of the sense of humor and the pathos with which Farley Mowat writes, it is a beautiful book. There are wolf packs in the U.S. and in Canada today but the numbers are sadly low. At least they are not all gone. The fight continues to save animals and nature from greed. "We have doomed the wolf not for what it is but for what we deliberately and mistakenly perceive it to be: The mythologized epitome of a savage, ruthless killer—Which is, in reality, not more than the reflected image of ourselves. We have made it the scapewolf for our own sins." One of the best and most visual and visceral books I've read in a long time. Also, quite amusing. Mowat's voice feels so kindred, and I'm so t "We have doomed the wolf not for what it is but for what we deliberately and mistakenly perceive it to be: The mythologized epitome of a savage, ruthless killer—Which is, in reality, not more than the reflected image of ourselves. We have made it the scapewolf for our own sins." One of the best and most visual and visceral books I've read in a long time. Also, quite amusing. Mowat's voice feels so kindred, and I'm so thankful for it. A must-read/naturalist need, for sure. Very funny and interesting because it is a (probably...) true story, although there is some discussion on that part. I agree with the writer though, sometimes a non scientific way of writing about a species is much more accurate and interesting than an actual scientific report. I hope that one day humans will stop being savages and allow the wolf some more space in the world again, as they truly are amazing creatures. and then I just could NOT continue with it !!!!!!!!!!! I just LOVED and enjoyed it as much as I had before. destroying reputations of both teachers and students, the list goes on. This happens in many work places. in the executive. One way was by matching their lies with my own. It worked very well. And I suspect that this was probably one way Farley managed to survive and undermine the Idiots running his Government Department. You will meet them in the first chapter of "Never Cry Wolf." You will also meet the Hunters and Officials who lied to the Government Department about wolves. There is probably a Forest of Lies in this book and I have no way of untangling them. Let it be said however that this is one of the most enjoyable Pack of Lies or Not that I have read in a long, long time. was one of the most enjoyable I've read or not in a long, long while !!! even if I've said it before. You will just LOVE and be AMAZED by the wolves. And I wonder sometimes if Farley lied about them to save them. I would back him ALL the Way . P.S. I am NOW trying to discover what it was exactly that Farley has been accused of!!! 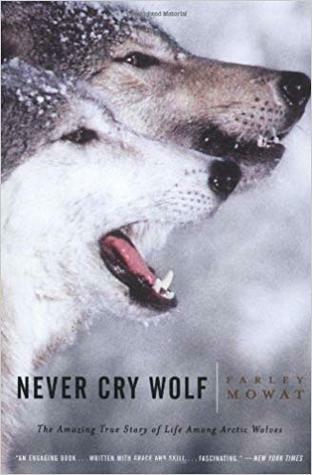 Never Cry Wolf is Farley Mowat’s personal account of his observation of wolves in subarctic north Canada. As a biologist working for the government, he is called on to discover the mystery of how the population of caribou is decreasing dramatically. The thought is that wolves are largely responsible. Mowat heads out on a small plane into the coldest reaches of Canada to find out if the wolves are the ones responsible. I liked Mowat’s writing style and tone throughout, just how he presents himsel Never Cry Wolf is Farley Mowat’s personal account of his observation of wolves in subarctic north Canada. As a biologist working for the government, he is called on to discover the mystery of how the population of caribou is decreasing dramatically. The thought is that wolves are largely responsible. Mowat heads out on a small plane into the coldest reaches of Canada to find out if the wolves are the ones responsible. The most rewarding aspect of Never Cry Wolf is Mowat’s account of his experiences as he gets closer to the wolves. His interpretation of the wolves at the beginning is very human and typical, as he does not trust them and fears often for his safety. As he continues to observe, though, he forms a bit of a bond from afar, even giving all of the wolf family names and seeing their personalities and characteristics. We come to understand that maybe the image and legend of the “big bad Wolf” as a savage killer is a bit reaching, as Mowat debunks this myth. We come to understand through his narration that there is much more complexity to this animal. There is also a Disney (yes, Disney) film for Never Cry Wolf (1983). Although the film does contain some of the parts of the novel, it definitely changes many aspects of Mowat’s book. Brings back the dreams I had when I was still studying biology - definitely would have wanted to follow in the tracks of my loony loon-specialist animal behaviorist prof.
At first I wondered if I was going to like the voice of the writer as it seemed a bit too light and ignorant and laughing, but it left room for his honesty as his adventure continued, and for him to reveal his foolishness-es in interpreting the wolves and in cross-cultural interactions with the people he encountered as well. I Brings back the dreams I had when I was still studying biology - definitely would have wanted to follow in the tracks of my loony loon-specialist animal behaviorist prof. I didn't realize until the end how I was reading the title and how contrary that was to what he was trying to say in it - I really think I was interpreting it in the same way the Russian translators did in titling the Russian printing "Wolves Please Don't Cry" - something related to the mourning of wolves. Whatever block was in my brain that made me look confusedly at the title and wonder how else it could be read, suddenly fell away as I sadly turned the last page, leaving behind the epiphany that flashed into my brain as I thought of "The Boy Who Cried Wolf," and how the author here talked of all these wildlife managers in North American governments who were blaming the fall in caribou population on the wolves while encouraging irresponsible hunting behavior from adventure-mad trophy hunters who wanted the scheduled adventure and excitement minus the real hardship of the wilderness and the deeper understanding linked to that. He went to the north to prove them right but thankfully was open enough to see what was before his eyes instead of the invention of human imagination that made the wolf howl a sound of terror for generations. I read a lot of Farley in middle school and loved him; little bits of this from an early reading have stayed with me for 30 years, and there's a warm feeling in revisiting them. No one does couthy quite like a Canadian and he is not immune; this is really quite sentimental and anthropomorphic, but consciously so, and as he is famously so enthusiastic and entertaining about all things wild, I forgive him. Also, very funny - he's a great storyteller and nicely dry (in that other, rarer, Canadian sp I read a lot of Farley in middle school and loved him; little bits of this from an early reading have stayed with me for 30 years, and there's a warm feeling in revisiting them. No one does couthy quite like a Canadian and he is not immune; this is really quite sentimental and anthropomorphic, but consciously so, and as he is famously so enthusiastic and entertaining about all things wild, I forgive him. "Because of the importance attached to scatology in Ottawa...."
Having worked in two government departments in Ottawa in my studentness (Energy Mines & Resources and the MOD), I can relate. I need to find and reread (again) his The Siberians which I was also impressed by: unabashedly enthusiastic about the people he met, and to some degree their ways of doing things, in the 1960s - in the spirit of, though not the technique of, Red Plenty: Inside the Fifties' Soviet Dream. I also mean to check out The Farfarers: A New History of North America though I have a vague idea that this is where he lost it. In any case he should be better known outside of Canada than he is, imho. He is a total classic. The feelings that surround this book are complicated, but the book itself is not. This is a charming read that is sharply written, well engaging, and joyful. The writer clearly loves his subject and his idealism is encountered constantly without feeling heavy handed or naive. Each wolf in this story is a distinct character and the narrator presents each challenge playfully without diminishing the danger present. The majesty of the hunt is also detailed and revered with colorful language without b The feelings that surround this book are complicated, but the book itself is not. This is a charming read that is sharply written, well engaging, and joyful. The writer clearly loves his subject and his idealism is encountered constantly without feeling heavy handed or naive. Each wolf in this story is a distinct character and the narrator presents each challenge playfully without diminishing the danger present. The majesty of the hunt is also detailed and revered with colorful language without being alienating. That said, and once the book is done, a few minutes of research will quickly yield considerable controversy behind this book. As it turns out many sources claim that the narrative is fabricated and much of the observations could never have occurred. While these repeated statements, many of which are articulate, cause a dilemma for the reader it doesn't take away from the experience of reading the book. Perhaps the 'true life story' from the front cover needs to be banished? Perhaps Mowat was writing as Dante did, making himself a character in his journey toward universal discovery? Oh, thank God it's over. I knew this book would be pro-wolves. I'd read that this was fiction mixed with experience. I knew a lot of the anthropomorphism was deeply ingrained in the story, and I was okay with that, pleased to go in with a grain of salt firmly in hand. What I didn't know is that Farley Mowat's Never Cry Wolf would be so pro-Farley-Mowat. I wasn't prepared for the ego, for the use of the vehicle of literature (and wolves) to so firmly slap its author on the back, over and over and Oh, thank God it's over. I'd had enough by about one-third through. But as it's Classic CanLit, I decided I'd better keep going. Have you ever read a non fiction book that is written in a way that makes it feel like it is more fictionalized then the factual truth? This book might be one of those, I have no doubt that the wolf way of living is as described by Mowat, real and factual but, I can see that he might have embellished the story telling part of his experience. Nevertheless, this was an exceptionally enjoyable read. Mowat studied biology at the University of Toronto. During a field trip to the Arctic, Mowat became outrag Farley McGill Mowat was a conservationist and one of Canada's most widely-read authors.